(HOLLYWOOD, Fla.) – Quality Inn & Suites - Hollywood Blvd & Port Everglades Cruise Port, a budget-friendly, full-service cruise port hotel in Hollywood, Florida, near Port Everglades cruise port and the Fort Lauderdale/Hollywood International Airport (FLL), has completed renovations to the swimming pool and deck area of the hotel. The completion of the pool and deck area culminates a busy time for Quality Inn & Suites - Hollywood Blvd & Port Everglades Cruise Port, as the hotel prepares for the peak of the South Florida cruise season. Welcomes guests from all over the world, this Hollywood, Florida hotel specializes in vacationers departing from Port Everglades and the Port of Miami cruise ports, those attending sports or entertainment events at the recently upgraded Hard Rock Stadium, or simply vacationers looking to enjoy South Florida's sunny, tropical climate and pleasant weather as temperatures dip down in the northern states. 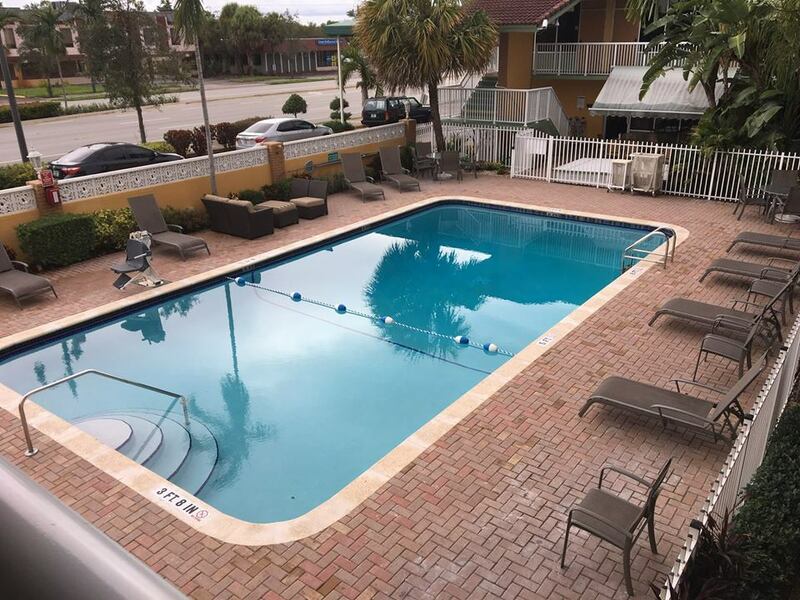 "We are very happy that our guests can once again enjoy the pool and deck area," stated Izzy Fintz, Hospitality Manager at Quality Inn & Suites - Hollywood Blvd & Port Everglades Cruise Port. "Excellent year-round weather is one of South Florida's main attractions, and we are excited to welcome our guests to enjoy it out by the pool!" Quality Inn & Suites - Hollywood Blvd & Port Everglades Cruise Port is a recipient of six consecutive White Glove Awards from the Superior Small Lodging Association (SSL) for outstanding cleanliness and service. Quality Inn & Suites - Hollywood Blvd & Port Everglades Cruise Portis a budget-friendly, full-service, pet-friendly Hollywood, Florida hotel in close proximity to popular South Florida tourist destinations such as Hollywood Beach, Fort Lauderdale, Miami, Port Everglades cruise port and the Fort Lauderdale/Hollywood International Airport (FLL). Located on Hollywood Blvd, just minutes from the beach, this Hollywood cruise hotel is a perfect destination for families and cruise vacationers. The hotel's proximity to the Hard Rock Stadium makes it a perfect destination for fans of the Miami Dolphinsä and Miami Hurricanesä football. Guest services include shuttle transportation to the airport and cruise port, long-term cruise parking, complimentary breakfast, heated outdoor pool, whirlpool tub suites and Wi-Fi. For more information, visit www.hotelhollywoodfl.com or follow the hotel on Facebook. Quality Inn & Suites - Hollywood Blvd & Port Everglades Cruise Port is a member of Choice Hotels International, Inc.® (NYSE: CHH).